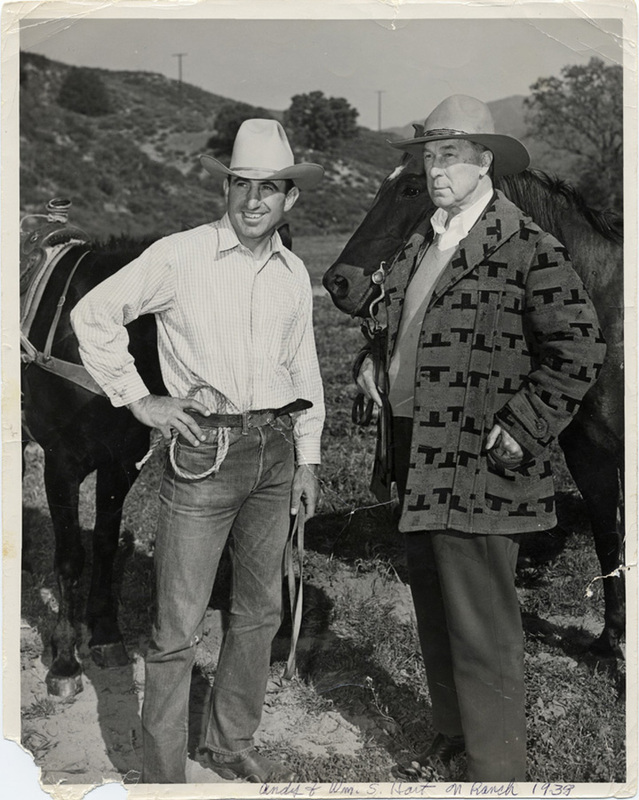 Andy Jauregui (left), famed rodeo cowboy in 1920s and 1930s, and William S. Hart, silent screen star and Newhall's leading citizen, at the Jauregui Ranch in Placerita Canyon in 1938. Placerita Canyon was dotted with movie ranches from the 1920s to the 1940s, and Jauregui owned one of them on land he leased from Standard Oil. Known as the Jones Ranch in the 1930s  when it was next door to property Trem Carr leased for his Monogram Ranch  the Jauregui property was sold by Chevron (aka Standard) in the 1990s to The Walt Disney Co. for an expansion of Disney's Golden Oak Ranch. Photo originally belonged to Noureen (Jauregui) Baer, one of Jauregui's daughters.